parents love to play together? Use your brain and a steady hand to play STACCABEES™, an exciting, easy to learn family game that kids AND parents want to play again and again! 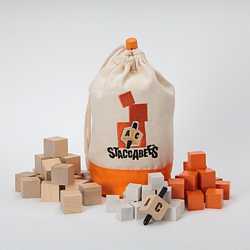 Players take turns spinning the top and, based on the results, place cubes on the “stac.” Be the first to balance all your cubes on the “stac” and you win!